On July 28th, Showa 30th (1955), in a heartbreaking incident 36 junior high school girls drowned on a beach in Mie prefecture. Of the nine girls who survived the incident, five had the same story to tell. The girls were all playing and swimming in the calm waters, enjoying the gentle lapping of the waves. Without warning, the water seemed to gather together, and a dark mass rose from the surface of the ocean. The mass took the shape of people in WWII air-raid hoods, dark in color, soaking wet and pouring water from every surface. As the mass rose, the figures become more defined, dressed in old-fashioned women’s work pants. There were hundreds of them. The girls tried to get away, but the water seemed to be sucked up towards the dark figures, dragging the girls towards them. One of the girls who survived said she felt a hand grab her leg and try and pull her under the water. She was able to break the hands grasp and make her way to the shore, but her friends were not so lucky. Afterwards, students who were on the beach and not in the water confirmed the story and all of its details. They saw the ghosts rising and dragging the girls under the water. After investigating the incident, it was discovered that exactly ten years before the incident, U.S. aircraft had firebombed that area, killing around 250 people. The bodies were not cremated, but were piled without ceremony into a mass grave on that beach. In this way one tragedy became two tragedies, as the ghosts of the war dead rose up again. The kanji for this is集団 (shudan, meaning “group” or “gathering”) and亡霊 (borei, which is a somewhat Gothic term for “ghost”). This story is based on a actual event, called the Kyohaku Junior High School Drowning Incident (橋北中学校水難事件) in Japanese. The school had gone to the beach as their annual excursion, and as swimming practice for the girls. At the time, swimming had been added to the official school curriculum, but as the school had no pool swimming practice was held in the nearby, usually calm ocean. The school principle and teachers were arrested and charged with negligence—the school was short-handed and had not brought along the required number of adult observers, and parents claimed their children were not yet strong enough swimmers to be unsupervised in the ocean. Ultimately, they were found not-guilty and cleared of charges. The girls’ deaths were ruled a mysterious, unfortunate accident. A pool was quickly built for the school, and the students no longer practice swimming in the ocean. Observers reported a sudden swelling of the waves and a rise in the water level that drowned the girls. Of the nine surviving girls, five reported a sensation of pulling on their legs, as if the sand was sucking down on their feet, holding them down while the water rose. Several also reported seeing the dark shape of women in air-raid hoods rising from the water. In 1956, the Ise Newspaper reported on the story of the war dead buried on the beach, noting that most of the dead had been refugees and were thus buried without name or ceremony. 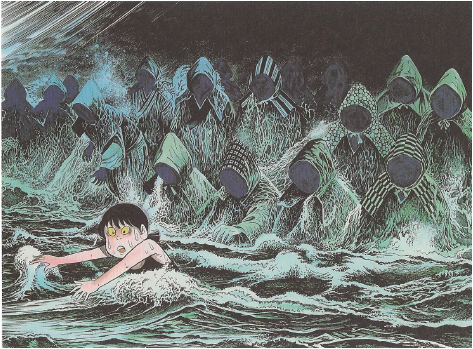 In 1963, one of the girls published an article in a Joshi Jishin magazine (Women’s Own Stories) called “How I survived an Encounter with a Ghost” that further spread the supernatural origin of the drowning. 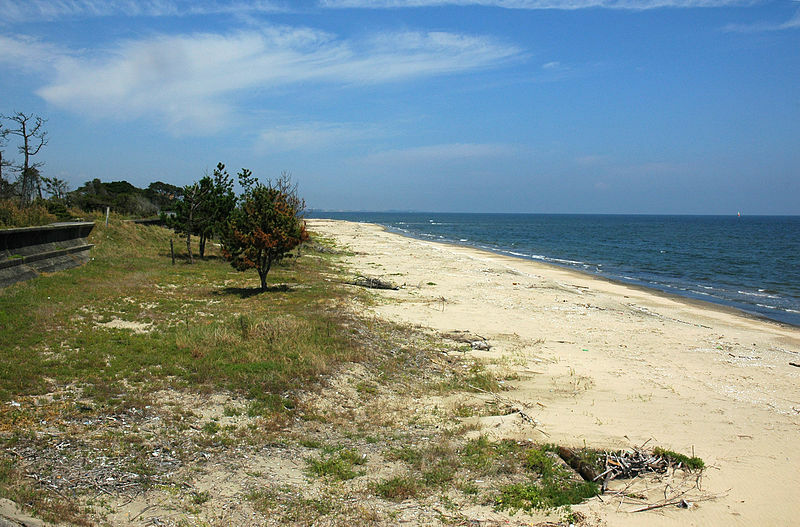 Several scientific explanations have been offered for the sudden swelling of the water based on the geographical features of the beach, along the supernatural one. It is clear Mizuki Shigeru prefers the supernatural explanation. The beach remains off-limits for swimmers. 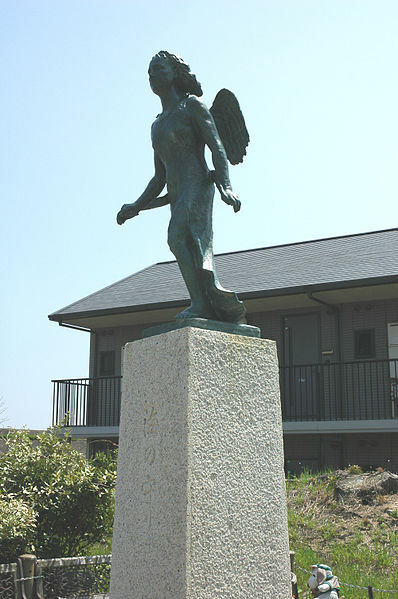 A year after the incident, a shrine was raised on the location, and a statue called the Goddess of Protecting Swimmers in the Ocean was placed on the beach as a memorial.